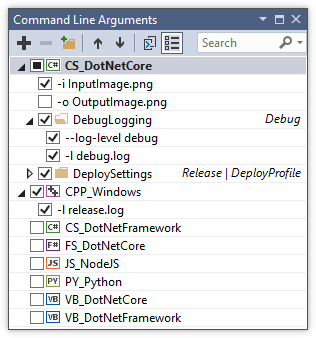 A Visual Studio Extension which aims to provide a better UI to manage your command line arguments. If you're using Cmake make sure to read the Cmake support wiki page. If the window is open or minimized the commandline arguments should not be edited via the project properties. Changes which are made in the window are applied to all project configurations (Release/Debug etc.) of the current startup project. The extension stores the commandline arguments inside a json file at the same location as the related project file. Ctrl + ↑ / Ctrl + ↓: Move selected items. Insert: Add a new item. Alt + Enable/Disable Item: Disable all other Items (useful if only one item should be enabled). There are three ways to paste items into the list, drag'n'drop, CTRL-V, and the context menu. Previously copied or cut items. Files, here a argument with the full file path is created for each file in the clipboard. Cut / Copy / Delete: Cuts/Copies/Deletes the selected items. Paste: Pastes the previously copied/cut items, text, or files (see Paste). New Group from Selection: Creates a new Group and moves the selected items into it. Split Argument (only available while ONE argument is selected): Splits the argument with the typical cmd line parsing rules (e.g. -o "C:\Test Folder\Output.png" is split into two arguments -o and "C:\Test Folder\Output.png"). Project Configuration / Launch Profile (only available while ONE group is selected): Shows a sub menu to select a Project Configuration/Launch Profile. If a Project Configuration/Launch Profile is set for a group, it is only evaluated if this Project Configuration/Launch Profile is active. Set as single Startup Project (only available while ONE project is selected): Sets the selected project as the startup project.